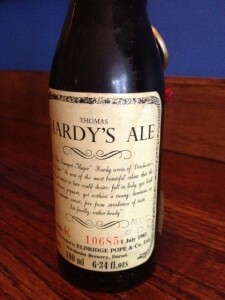 John Maxwell, restaurateur par excellence in Toronto (Allen’s, Dora Keogh Irish Pub), rang me up and said I’m intent on opening a Thomas Hardy’s Ale brewed 34 years ago. We met posthaste and the bottle indeed showed it was brewed on July 1, 1981. We met on July 1 just past: it was exactly 34 years. A lovely drink of beer, “sound old” by my lights, i.e., what the devotees in the 1800’s of old ale would have regarded as right proper old beer. A rare experience and a grateful one for me. Beer is funny, six months can go by and render a 6% ABV beer undrinkable from damp paper oxidation or vinegar spoilage – here a 34 year old beer, albeit much stronger, was like those bands which go out 25 years after their bloom of youth and prime – older, wiser, still good but in different ways than of yore, withal delivering top value.